I have always thought of myself as a sociable person but when I went to Argentina by myself for three months earlier this year, I learnt that making instantaneous friends is not as easy as I thought it would be. Before I left, everyone had assured me that I would meet like-minded travellers and that I would never really be alone as there are always lots of other people in a similar situation. That said, a deep-rooted fear of doing anything by myself had made me somewhat apprehensive about the trip and I found it took me a while to adapt to solo travelling. Where you stay is crucial to meeting similar people. I was very disorganised before I left for Buenos Aires and only booked a hostel the morning I was flying out. This was incredibly short-sighted given I was going by myself and had three months to fill. I ended up staying in an odd hostel where each room had a different ‘Sound of Music’ character name as all the popular hostels were booked up. There were only two other people staying there and neither of them had any interest in being friends! I moved two nights later to America del Sur in San Telmo which was a far more sociable hostel. That said, I still had to work up the courage to approach people and felt like a bit of a weirdo for travelling by myself. The first night there was an asado (BBQ) on in the hostel so I psyched myself up to go to it. I decided that if I just smiled at the first person I saw then it would be fine so as I came down the stairs I beamed my best smile at a girl only to have her grimace at me as though I had run over her first-born. So far, not so good! I kept walking and grabbed a seat at the nearest table. I had joined a group of Australians and they all had a minimum of eight tattoos each. Being tattooless, I found other common ground in the form of having grown up in Australia and managed to make some temporary pals while in the hostel. They all had different stories- one 18 year old guy was travelling for a year on inheritance from his mum after she died when he was little. Another 45 year old guy had travelled across the world on his motorbike with his best friend and BA was his final stop. The one thing we all had in common was a hunger to travel and everyone had a story to tell. While on the subject of hostel-goers, this article is hugely accurate in describing the ‘characters’ you find in every hostel! You wouldn’t know it when you see me in a Hispanic country but I actually studied Spanish at University and spent nine months learning and speaking Spanish in Seville. Despite this, when I arrived in Argentina I was terrified to speak Spanish after not having used it in over four years. This initial fear proved problematic my first night in Buenos Aires when I was staying at the ‘Sound of Music’ inspired hostel. In a most unlike me moment, I wasn’t very hungry at dinner time so I picked up an avocado and bought it back to the hostel. I went into the empty kitchen and couldn’t find a light switch. After groping around the cupboards in the dark for a few minutes, I gave up the search for a knife. While there was someone working at reception, I suddenly had a block about speaking Spanish and went up to my ‘Louisa’ room. Fed up, I started peeling off the skin of the avocado with my nails and ate it that way. It was pretty much a low as dinner goes. If you are basing yourself in a new city for more than a week and you’re by yourself, it definitely makes sense to give your days some structure and sign up for something that interests you. I stayed in BA for seven weeks and during that time, I did Spanish, yoga and photography courses. When I arrived first, I had nothing booked which resulted in a mild panic attack. The 12 weeks until my flight home seemed to stretch out indefinitely and I really started to wonder what I had got myself into. The first few days I wandered around aimlessly but once I joined up to a Spanish language school, I found it much easier to meet people. The majority of people I met at the school were all in BA by themselves which reassured me- I was worried I’d have to justify to everyone I met that I did actually have friends back in Ireland! My motto for travelling has always been ‘Just go with it’ and not to over-plan things but if you are by yourself, it’s a good call to have your first week or two organised so as to avoid panic attacks! It sounds like an obvious thing to say but when you go to a new place, you have to put yourself under pressure to go to say yes to everything you are invited to. The first few weeks in Argentina I went to absolutely anything I was asked to and this approach had me going to pool parties where I only knew (at a push) one other person, a beach holiday with a new friend from the language school, milongas (where luckily some eager-to-teach locals asked me to tango! 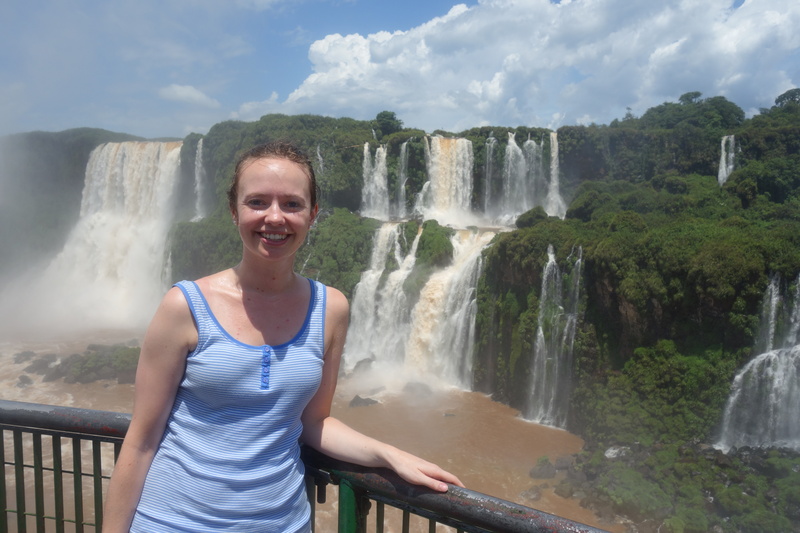 ), a foam party and a day trip to Uruguay. It was tiring constantly making an effort with new people and sometimes skyping my family and friends seemed a far easier option but I forced myself to go to everything and it really paid off. Within a few weeks I had a group of friends from places such as Brazil, Norway and Australia who were just as eager as I was to explore our new cityI Luckily I didn’t have to eat an avocado with my nails again! I guess this was the one thing I did right! An awkward part of travelling alone- having to get strangers to take nerdy photos of you standing by yourself!